Res Care is a specially formulated liquid resin cleaner designed to rid the softener of contaminants that salt alone cannot remove. Regular use of Res Care resin cleaner will restore the softener beads and control valve parts back to peak efficiency and maintain the life of the unit. For best results, use an Easy Feeder for continued defense of contaminant build-up. 99% of water softening occurs inside of the resin beads. Salt only washes away the calcium but leaves the iron, manganese, silt, metal particles and organic compounds. Over time, these will coat the resin bead causing inefficiencies or total failure. **Pro Res Care is NSF Certified to meet NSF/ANSI Standard 60 for drinking water additives. 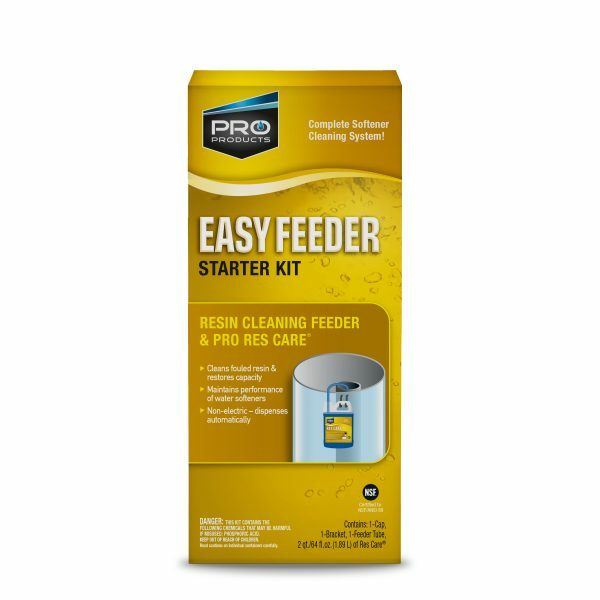 Continual Maintenance: Pro Products highly recommends the use of a Pro Easy Feeder to keep the softener running at peak efficiency. The unit feeds automatically and easily installs inside or outside of the brine tank. The Easy Feeder Starter Kit includes everything required for initial start-up. Manual Application (for Severely Fouled Units): Pour 4 oz. (1/2 cup) of Pro Res Care resin cleaner per cu. ft. directly into brine well (for softeners with no brine well, pour directly into salt tank when salt is low). Manually regenerate softener. Repeat regeneration if taste, odor, or discoloration is detected in discharge, then run cold soft water tap nearest the softener until the odor or taste is gone.